Sub: Modification of the Provisions relating to travelling allowance entitlements of Armed Forces Personnel consequent to the recommendations of the 7th central pay commission and government Acceptance thereof. A copy of Government of India Ministry of Defence No. 12630 / Mov C/242/D(Mov)/2017 dated 15th September 2017 received under ADG of Mov CDGOL & SM GS branch, IHQ of MoD (Army) letter No. 12630/TA/DA/Mov C dated 2oth September 2017 on TA entitlements is forwarded herewith for information and necessary action please. EDP cenflre-(Local) -with request to upload the circular on CGDA website. SUB: - MODIFICATION OF THE PROVISIONS RELATING TO TRAVELLING ALLOWANCE ENTITLEMENTS OF ARMED FORCES PERSONNEL CONSEQUENT TO THE RECOMMENDATIONS OF THE 7'” CENTRAL PAY COMMISSION AND GOVERNMENT - ACCEPTANCE THEREOF. 1. A copy of Govt of India, Min of Defence letter No 12630/Mov C/242/D (Mov)/2017 dated 15 Sep 17 with regard to Travelling Allowance entitlements to Armed Forces Personnel as per the recommendations of the 7th CPC and Govt acceptance thereof is forwarded herewith. 2. The above may please be disseminated to all an/Units under your control. 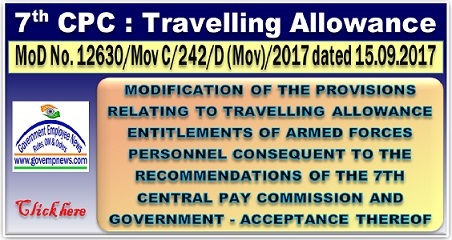 Sub:- MODIFICATION OF THE PROVISIONS RELATING TO TRAVELLING ALLOWANCE ENTITLEMENTS OF ARMED FORCES PERSONNEL CONSEQUENT TO THE RECOMMENDATIONS OF THE 7TH CENTRAL PAY COMMISSION AND GOVERNMENT - ACCEPTANCE THEREOF. I. I am directed to say that in pursuance of the decisions taken by the Govt on the recommendations of the Seven Central Pay Commission relating to Travelling Allowance entitlements, the Ministry of Finance have issued orders vide OM No.19030/1/2017-E.IV dated 13 July 2017 for modifying Travelling allowance entitlements of Civilian Central Govt employees. In pursuance thereto, sanction of the President is conveyed to the modifications in the Travel Regulations, 2014 (Edn) for Armed Forces Personnel as set out in Annexure to this letter. 2. The 'Pay Level' for determining the TA/DA entitlement is as indicated in relevant Special Army/Navy/Air Force Instructions. 3. The term 'Pay in the Level' for the purpose of these orders refers to Basic Pay drawn in appropriate Pay Level in the Pay Matrix as defined in relevant Special Army/Navy/Air Force instructions issued in pursuance to Govt decision on 7th CPC recommendations and does not include Non-Practising Allowance (NPA), Military Service Pay (MSP) or any other type of pay like special pay, etc. 5. The claims submitted in respect of journey made on or after 1st July, 2017 may be regulated in accordance with these orders. In respect of journeys performed prior to 1'St July, 2017, the claims may be regulated in accordance with the previous orders dated 29 Dec 2008. 7. The relevant Rules of Travel Regulations will be amended in due course. As these orders are based on MoF OM No.F-19030/1/2017-E.IV dated 13 July, 2017 as well as further O.M. No,19030/1/2017-E.IV dated 18 August, 2017, these OM would be referred to for settling any doubts/discrepancies. 9. This issues with the concurrence of Ministry of Defence (Fin/QA) vide their UO No.505 dated15-9-2017.